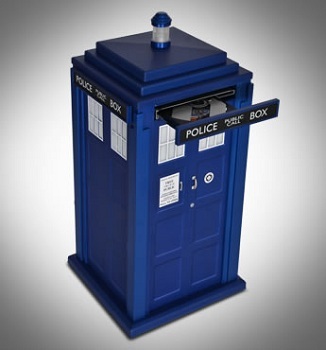 The iconic blue box from Doctor Who can be your new workstation. The fact that the Chameleon Circuit never functioned properly was a constant source of irritation for the Doctor, but it could come in handy if you're in the market for a new PC. British electronics retailer Scan has a new PC available for the holiday season that should look familiar to Doctor Who fans. This admittedly expensive computer features an aluminum case that looks exactly like the TARDIS - the Doctor's blue police-box-slash-time-machine - and enough power under the hood to make it a viable workstation or lightweight gaming rig. The TARDIS (Time and Relative Dimension in Space) PC starts at Â£780.99, and comes with a 3.1 GHz Dual Core processor, 8 GB of RAM, and a 500 gig hard drive. If these components don't tickle your fancy, Scan has multiple options for swapping out parts, including more powerful processors, bigger hard drives, and (somewhat) better graphics cards. One non-negotiable piece of the package, however, is the joint Blu-Ray/DVD-R drive that pops out of the "Police Box" signpost. If you want a computer that can play Far Cry 3 at maximum settings and run like butter, this is probably not the PC for you. However, if you're looking for a big present for the Doctor Who enthusiast in your life (even if it's you), it's hard to beat this one as a conversation piece. If only Scan sold the case by itself, then PC users could simply buy whatever parts they need and construct a computer to fit. Maybe it's best to chalk that decision up to some disgruntled Cybermen and call it a day.